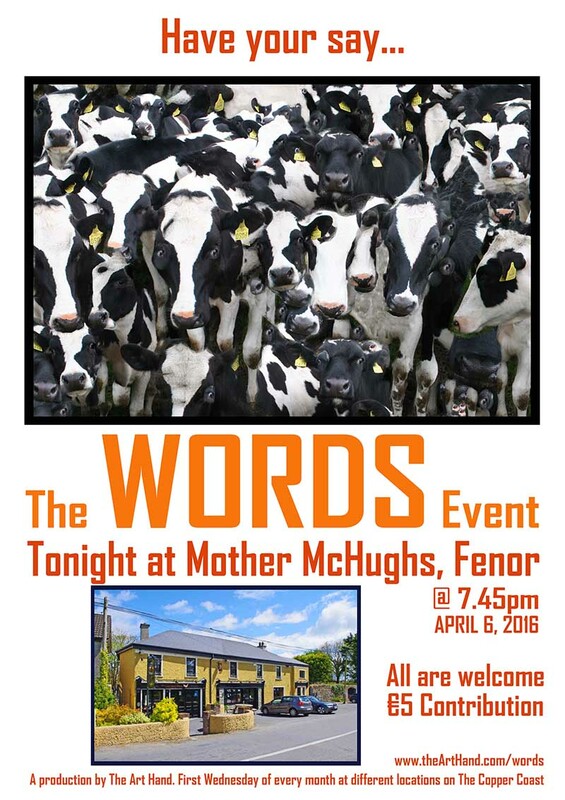 Here’s the poster from the last WORDS event which was held in at Mother McHughs pub in Fenor the udder night. Well done to all who attended this very special event. The next WORDS event will take place at The Art Hand on May 4th and we will be at The Copper Coast Geopark Visitors Centre in June. Please spread the word, we’re a nice bunch and we won’t force you to perform! The WORDS event takes place in different locations along The Copper Coast on the first Wednesday of every month. Further details of The WORDS Event can be seen HERE. This entry was posted in Fenor, Mother McHughs, The WORDS Event and tagged bunmahon, comedy, Event, Fenor, Ireland, open mic, performance, poetry, prose, Spoken Word, Storytelling, The Art Hand, The Copper Coast, Tramore, waterford, Words, writers, writers group. Bookmark the permalink.